Wolfgang Hoeschele has an interesting diagram in his book The Economics of Abundance (p. 149) , of which this is a modified version. The explanation, adapted from his book, are below. “Many of our current property rights are designed either to allow a small number of people to monopolize those resource (imposing scarcity on everyone else), or to promote their unsustainable use (creating extreme resource scarcity for future generations). If we wish to generate abundance instead, i.e., the condition that all people, both now and in the future, are able to thrive, we need to fundamentally redesign our property rights. 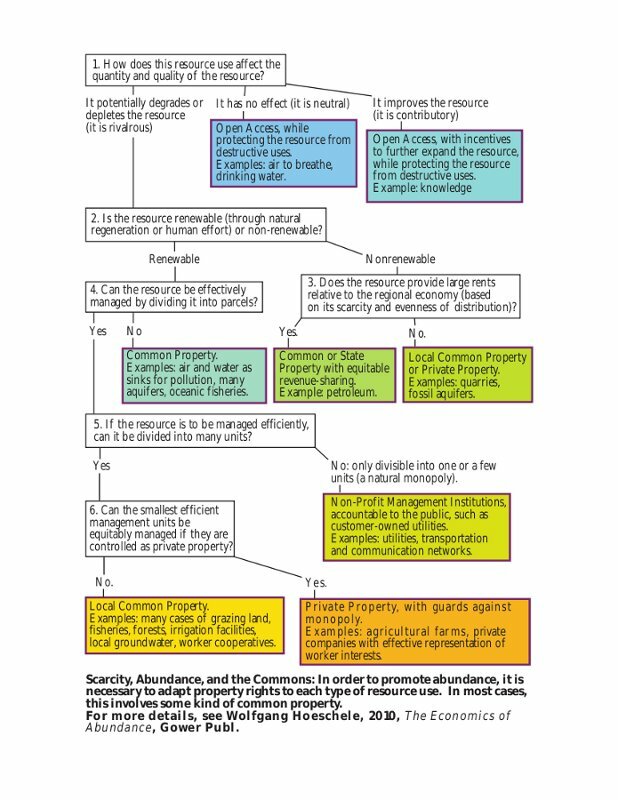 The flow chart shown here offers a framework for the kinds of property or resource use rights that would promote abundance, tailoring them to each specific type of resource and how it is used. This framework is explained in detail in my book (The Economics of Abundance: A Political Economy of Freedom, Equity and Sustainability, published by Gower in 2010, pp. 147-166); the following is a summary. Note that the flowchart shown here is slightly modified from the one that appears in the book.